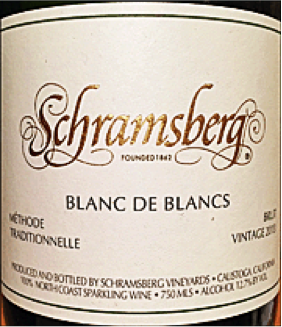 This Brut is produced at the Schramsberg estate in Napa Valley’s famed Diamond Mountain AVA. The sparkling wines are produced Traditionelle Method, (the process used in making Champagne) after the wines are blended they are aged for two to seven years in Schramsberg’s hillside caves, providing optimal conditions for the development of exceptional aromas flavors and textures. The 2013 vintage Blanc de Blanc, is made from 100% Chardonnay and it has bright and fresh aromas of grapefruit, mango, apricot, lemon, and white peach. The fruitful fragrance intermingles with hints of fresh bread, vanilla cream pie, and rose petals. Freshly sliced apples, zesty citrus, and bright pineapple flavors present to the palate. This wine is classic is a great alternative to Champagne at a much lower cost $36.99. Here are just a few reviews of the “unofficial” sparkling wine of the White House. KM The Wine bible 95 points, I love the freshness of this wine it’s like drinking cold mountain air early in the morning. The flavors are delicious and pure (iced pear sorbet), the bubbles are crisp, firm, and lively, A thousand points of lightness, in your mouth.92 Points- Editors' Choice WE, Delicious lemon-meringue aromas make a great start for this medium-bodied Chardonnay-based wine. Flavors are lively, lemony, with baking-spice accents. A buttery, creamy element carries into the lingering, tangy finish. 92 points Connoisseurs Guide, with a defined mineral streak enhancing the lightly lemony aromas, it’s crisp, effervescent, and balanced by yeasty richness. Wonderful to be sipped on its own, it will make first-rate pairing with some fresh oysters, and crab. King Crab Legs are already cooked when you purchase them, because of this, King Crab only needs to be adequately heated before serving. If your king crab is frozen you should cover it and thaw overnight in your refrigerator, in a colander and a bowl to catch any liquid. Thawed crab legs can be maintained in the refrigerator for two days, but they should really be cooked as soon as possible. Let the water in the bottom of the steamer pot come to a boil, add the crab legs in the steamer and cover. The crab will be heated through when you can smell it about 5 to 7 minutes I also pick one up with a tong and touch the meaty part just to be sure that it is indeed warm. The best way to get at the meat is to use scissors. I use the kitchen shears that come with knife sets. Just break the crab apart at the obvious places and then cut down the middle. I also have, but is not necessary, a glove in case the crab is really hot or if it is very spiny. The king crab is sweet and rich and I eat it straight but melted butter and or clarified butter and lemon are nice accompaniments. Serve with crusty fresh baked bread and a fresh green salad with heat of palm avocado and good tomatoes for a decedent treat. A Happy & Healthy New Years! This wine and pairing are perfect to kick off the beginning of fall. The wine and the dish are a little richer and warming for the cool evenings to come. I have made this dish many times and when I tasted this wine last week I knew it would make a great pairing. This Gran Reserva is made from old vines (up to 100 years old), in the region of Catalunya, situated north-east of the Iberian Peninsula in Spain. The vineyards are planted at the highest elevation (400 meters above sea level. ), within the D.O. of Catalonia. The dry climate and clay / limestone soil benefit the vineyards and particularly the varietals this wine is made from, 45% Tempranillo, 40% Cabernet Sauvignon, and 15% Grenache. The wine spends 36 months in American oak adding subtle spice and vanilla notes to this dark burgundy colored wine. Soft aromas of dark and red berries along with plum and sweet tobacco leaf invite you to take a sip. Cherry and cassis flavors commingle with earthy minerality and softened tannins (from 11 years of aging), creating very well balanced wine. There is a bit of pleasant clove like spice in the lingering finish of this medium bodied wine. This Gran Reserva if it were from, Rioja or Ribera del Duero would be two to three times more expensive, yet no better, a steal at $21.99. This dish is super satisfying and it is the perfect time of year to make this dish because almost all of the ingredients are locally fresh. Heat up the oil in a large saucepan and fry the eggplant on medium heat for about 15 minutes, or until nicely brown. Drain off as much oil as you can and discard it. Add the tomato paste to the pan and stir with the eggplant. Cook for 2 minutes, then add the wine and cook for 1 minute. Add the chopped tomatoes, water, and salt, sweetener of choice and oregano and cook for 5 minutes to get a deep-flavored sauce. Set aside; warm it up when ready to plate. Shuck the corn and chop off the pointed top and stalk. Use a sharp knife to shave off the kernels -- either stand each ear upright on its base and shave downward, or lay each ear on its side on a cutting board to slice off the kernels. You want to have 1 1/4 pounds kernels. Place the kernels in a medium saucepan and barely cover them with the water. Cook for 12 minutes on a low simmer. Use a slotted spoon to lift the kernels from the water and into a food processor or blender; reserve the cooking liquid. Process them for quite a few minutes, to break as much of the kernel case as possible. Add some of the cooking liquid if the mixture becomes too dry to process. Now return the corn paste to the pan with the cooking liquid and cook, while stirring, on low heat for 10 to 15 minutes, or until the mixture thickens to mashed potato consistency. (Be aware that if you have a lot of liquid left in the pan, it can take a while to cook down the polenta, and it will sputter. Consider holding back some or all of the liquid. Alternately, if you like the consistency after processing. Fold in the butter, and cheese, salt and some pepper and warm for 2 minutes. Taste and add more salt if needed. Plate in a large shadow serving dishes and top with warmed eggplant sauce, garnish, and pour you and your guests a glass of wine. This is a grown up Sauvignon Blanc, made from estate grown grapes from Monarch Mine Vineyard. The soil that the vines are grown in are very rocky, which adds to the wines minerality .Fermented in stainless steel tank at 55˚F, then aged for nine months in neutral French oak barrels on lees, producing a wine that has a delicious rich crispness. The aromas and flavors of the wine are suggestive of lime, casaba melon, and green papaya. The finish is brisk and fresh with a note of lingering river stone like minerality. Absolutely satisfying as an aperitif, and a good match for light summer meals. The Wine Enthusiast awarded it 92 points and an editor’s choice designation and had this to say about it "This standout wine has enticing herb and mineral aromas, plus rich, unorthodox flavors that resemble fresh fennel bulb and crisp white peach along with racy acidity and a good, substantial mouthfeel with a memorable personality". Spread the bread cubes on a rimmed baking sheet and toss with 2 tablespoons oil and a pinch of salt. Bake until they are dried out and pale golden brown at the edges, about 7 to 15 minutes. Let cool on a wire rack. Cut tomatoes into bite-size pieces and transfer to a large bowl. Add mozzarella, onions, garlic paste, 1 tablespoon vinegar, oregano or thyme, 1/4 teaspoon salt and the red pepper flakes if using. Toss to coat and set aside. In a medium bowl, combine remaining 1 tablespoon vinegar, the mustard, 1/4 teaspoon salt and some black pepper to taste. While whisking constantly, slowly drizzle in the remaining 4 tablespoons olive oil until the mixture is thickened. Stir in cucumbers, basil and parsley. Add bread cubes, cucumber mixture and capers to the tomatoes and toss well. Wine’s symbolic significance during the Passover Seder, is observed in Jewish households around the world. During a Seder dinner, each adult, (Grape juice for kids) drinks four cups of kosher wine, representing the redemption of the Israelites from slavery under the Egyptians. Four cups of wine are drunk as part of 15 rituals practiced during a Seder dinner. Kadesh, a blessing over wine and the first cup is drunk. Maggid, the telling of the Exodus story (the longest section of the Seder) the second cup is drunk. Barech, grace after meals, and the third cup is drunk, and a cup is poured for the prophet Elijah. Hallel, singing psalms of praise, and the fourth cup is drunk. Thank you to the members of the United Synagogue of Hoboken who helped Cork curate our kosher selection, during a tasting two weeks ago, as this wine was one of the favorites. Beitzah, a roasted egg symbolizing the temple sacrifice and the continuing cycle of life. Haroset, a paste of fruit and nuts symbolizing the mortar used to build the pyramid of the pharaohs. Mar'or, a bitter herb (like horseradish) to represent the bitterness of slavery.Karpas, a green vegetable (usually parsley) representing spring. A bowl of salt water to dip the karpas symbolizing the slaves' tears. In addition to the traditional Seder plate here is a great recipe to include in your Seder celebration.